Snorkel, zipline, and rappel in the Riviera Maya on a 6-hour, small-group adventure tour that’s specially designed for adrenaline lovers. You’ll explore Caribbean marine life, the jungle canopy, and an underground river system on this full-day tour, which includes hotel pickup and drop-off, all activities, and a buffet lunch of Mexican cuisine. Get an early start on the day with 7:15am pickup at your hotel in the Riviera Maya, then board a climate-controlled vehicle for the first adventure of the day, snorkeling in the Caribbean Sea. 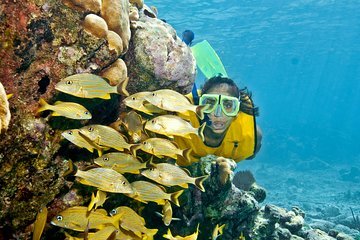 Novice snorkelers can get the basics of using snorkel gear before slipping below the surface to see schools of bright reef fish and underwater ecosystems in a snorkeling area that's also home to barracudas and sting rays. Head from the sea to the jungle for a zipline experience, taking on ziplines that range from 591 feet (180 meters) to 1,214 feet (370 meters) before climbing a rappel tower to lower yourself 50 feet (15 meters) to the jungle floor. Learn about the unique plants and animals that thrive in the Yucatec jungle, with the chance to watch for wildlife in a natural environment. The limestone plateau of the Yucatan Peninsula is laced with underground rivers, limestone caverns, and caves, and you’ll go below ground to explore a freshwater river in a cenote. After your underground river experience, dry off and refuel with lunch at a Mexican buffet. This 7-hour tour concludes with drop-off at your hotel at roughly 2pm. We had an incredible tour with Eli which included ziplining, rappelling and snorkeling. The ziplining was safe, well staffed, and there were something like 7 lines to zip line down so plenty of opportunity to enjoy. There was also rappelling but it was a bit tame, just rappelling down 3 steps and then lowering yourself down to the ground. Snorkeling in the cenote was beautiful with all the stalagmites and stalactites. After that we had a lovely lunch that was simple but very tasty, and then snorkeling in brackish water where we saw lots of different fish. Our guide Eli was very friendly, knowledgeable about the activities and science around it, and made us feel safe and in good hands. Would definitely recommend this excursion. too many things and not enough time on any one particular one. i wish the repelling lasted longer and had more than one site, i wished the zip lining was longer. I thought the underwater cave was cool but DEFINITELY NOT FOR PEOPLE with claustrophobia. the coral areas werent very impressive and it rained a lot the day we went so they ended things short which is ok for safety but i still wasn't too impressed. This is a great company, we did snorkeling, zip lining and rappelling. Lunch was included and delicious. Tour guide was wonderful and very knowledgeable. I plan to do this tour or more tours with Mayas Adventuras. Great little collection of activities. They spend too much time trying to get you to pose for pictures and then buy them at crazy prices though. Particularly when they force you to stop on the rappel so they can take some poor pictures of you. Also, the lunch...maybe have a good breakfast before. Our tour guide was Memo, and he was absolutely fabulous. He guided us through everything, told us what we needed to know, was there when we needed him, and put us first. I was able to learn a lot while still having fun. The activities were amazing, well thought out, and executed in an appropriate manor. I will remember this trip for a long time, and recommend it to friends. Thank you! The tour Guide Savino was an all around great guy, very informative and had knowledge on absolutely everything we saw and did. From the Marine life that we snorkeled with, barracudas, sting ray, all the various types of fish. He explained everything, from snorkeling 101, to Zip-line 101, to Rappel 101. No stone was left unturned, was patient with children and even the adults who got scared at the top of the tower for the Zip-line! Lol. The food after the excursion was good, and they had even taken pictures during the Zip-Line that i wasn't aware of, they sell the photos for additional money but the price point is nothing ridiculous. Savino was a great tour guide i would definitely recommend this tour to anyone, or do it again myself. Overall Impression: Buy a cheaper version of this tour. Not worth the full price charged. You can no longer snorkel with the turtles, but we did snorkel in a tidal pool with parrotfish, angelfish and others instead. But the reason I bought the pricier option was the turtles. Good: The guide was very personable and honest up front. The provided lunch was good. The rappelling was over very quick 60 seconds per person, if that. I would like to see a second try. There were only 3 zip lines, although they were fun. But having been on other tours with up to 12 zip lines this was kind of lacking. The Cenote snorkel was good and refreshing. It came at the perfect time for us. Snorkeling in the tidal pool took about 45 minutes to get there and was nice, but a letdown from the expectation of turtles. I really enjoyed the tour however I didn't like your tour guide. He was quite rude, inappropriate and only favoured the tourists in the group who were of Mexican or Spanish decent. He made a mockery of me in front of two tour groups which i didn't appreciate. Great locations, just need a new guide. We loved Snorkel Our guides were wonderful - the ATVs were a blast and the cenote/cave swim was gorgeous! We have absolutely no complaints and would gladly do it again. Gabby was our tour guide and she was great! She was knowledgeable about the culture and land and she gave us a lot of information. The Cenotes was amazing and so was the zipline. I did not do the rappeling because I was too scared. The sea turtle snorkeling was so great, I have never seen such big turtles! I was amazed! It was a bit crowded in Akumal where the turtles are but it is a public park so it is not under Adventuras Mayas control.